With central heating prices soaring in line with increasing energy bills, it has become even more noticeable when the heating system starts to play up. Not only do radiators feel colder but they take a lot more energy to heat and will cool down a lot quicker. One of the reasons that this may occur, especially in an older central heating system, is a build-up of sludge within the system. A powerflush aims to rid the system of imperfections and it can also get rid of loud boiler noises and provide other benefits too. Sludge can form in central heating systems after just a few years of use. This treacle like substance, which can vary in consistency, is most commonly caused by imperfections in the water but also from corrosion to pipes and other components of the heating system. Debris and dirt builds up and further exacerbates the problem, leaving a substance that is much more difficult to heat than pure water would be. A power flush aims to literally flush out the system, ridding it of contaminants and leaving you with a good quality heating system that once again provides heat for the whole house. A positive side effect of power flushing is that it will remove loud and irritating noises that may be ruminating from the boiler, the pump, or the pipework too. A power flush utilises a low pressure flushing system that injects a large volume of water combined with high power cleaning fluids into the system. 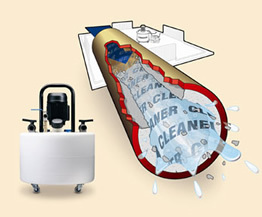 These cleaning fluids will clean the inside of the system while the water sweeps the debris and dirt out of the system. The end result is a central heating system that is clean and uses clean water providing you with a more effective and better quality heat for your home. Typically, a central heating system will require power flushing every five or six years and will take approximately 6 hours to complete, although actual figures will depend on a number of factors. What’s more, if you intend to have a new boiler added then you should ensure that your heating system is clean first because this will directly affect the performance of the boiler and may be a prerequisite for your boiler manufacturer warranty.